Majesco, a global leader of cloud insurance software solutions for insurance business transformation, has released a new thought leadership report which underscores why insurers must rapidly shift to a new era of insurance for growth and retention of customers. Read more. Large commercial brokers are prioritizing workflow, analytics, and AI technologies to differentiate themselves in a competitive marketplace. In a new report, research and advisory firm Novarica provides an overview of large commercial brokers' business and technology issues, data about the marketplace, and several examples of recent technology investments by large commercial brokers. Read more. A small number of innovative chief marketing officers are helping their organizations generate shareholder returns 11 percent higher than those of their industry peers by delivering hyper-relevant customer experiences, according to a new report from Accenture. Read more. Slice Labs has announced Slice Mind, a new business unit to help companies with personalization, experimentation, simulations, predictions, risk modeling, and product recommendations. Slice Mind combines AI, machine learning and behavioral psychology into an insight engine that transforms data insights into actions in order to deliver real business value. Read more. Marsh, a global leader in insurance broking and innovative risk management solutions, has announced the launch of Cyber Catalyst by Marsh, a new way to assist organizations in making more informed choices about cybersecurity products and services to manage cyber risk. Read more. According to KPMG International's new global survey, most enterprises are not scaling Intelligent Automation (IA) technologies – AI, advanced analytics, and RPA – fast enough to meet desired objectives and returns. But organizations that are scaling IA technologies are seeing strong financial performance. Read more. Insurers are under pressure to seize new market opportunities, and new research indicates that poor business processes can be just as much of an obstacle as poor technology. In two new studies, research and advisory firm Novarica provides high-level benchmark information on product introduction and modification speed, analyzing which factors correlate to faster or slower total cycle times. Read more. The latest Aite Group report examines the life insurance and annuity core policy administration vendors in North America, with a focus on the integration capabilities of external third-party data and usage of API frameworks. The ability to seamlessly integrate internally and externally, with minimal effort, is key to the success of these platforms. Read more. Archway Insurance, one of Atlantic Canada's largest and fastest growing insurance brokerages, is expanding its footprint in New Brunswick with the purchase of Hall and Fairweather Insurance in Saint John, effective April 1st. Read more. My Mutual Insurance successfully completed their implementation of the Insurance Business Solution (IBS) as their enterprise back-office. The IBS product provides My Mutual with a fully integrated solution for their insurance operations including a technology path as they welcome digital changes in the industry. Read more. LexisNexis® Risk Solutions has released its 2019 “Future of Claims” report, revealing strong alignment between insurance carrier practices and consumer desires bringing opportunities to expand in automation for greater mutual benefit. With automation becoming more pervasive, consumers expect insurers to offer easy digital access to products and services – but they also want a personal touch. Read more. Equisoft and GCU are pleased to announce the signing of a multi-year agreement that will allow GCU to consolidate all lines of business on a single, modern and agile policy administration system and offer an enhanced digital experience. The project will be deployed using the Equisoft Composite Cloud offering. Read more. Aviva Canada is pleased to announce a strategic partnership with The Hartford, a leading U.S. insurer, to support the full service and strategic requirements of our Small & Medium Enterprise (SME) and Large Commercial insurance clients and brokers in Canada with operations and assets in the United States. Read more. Sun Life Assurance Company of Canada is proud to offer gender affirmation coverage through Extended Health Care plans. Everyone experiences gender in their own unique way, for some this may mean being born a male but identifying as a female – or vice versa. Sun Life's extended coverage will help people transitioning embody their authentic selves. Read more. Finaeo has announced an oversubscribed funding round led by fintech-focused investor Luge Capital with follow-on participation from all previous major investors, including Impression Ventures and iGan Partners. The diverse group of investors provides Finaeo unparalleled access to both strong capital partners and industry support. Read more. When it comes to addressing insurance pain points of homeowners in Canada, insurance companies are falling short in meeting their expectations, according to the J.D. Power 2019 Canada Home Insurance Satisfaction Study. Read more. There is an old adage – Parkinson's law – which says: “Work expands to occupy the time and resources that are made available.” When I read a few postings around the Platform Economy, I realized that this was not going to make the cut, specifically with all the bazillionaires you've ever met. I picked up an article from McKinsey: “Insurance Beyond Digital: The Rise of Ecosystems and Platforms.” Insurance was the primary focus throughout, and I noted this compelling snippet: “By 2025, as this revolution gains speed, McKinsey expects 12 distinctive and massive ecosystems to emerge around fundamental human and organizational needs. These 12 ecosystems will account for ... roughly 30 percent of all global revenues.” Read more. BobTrak builds enterprise software for Insurance and Financial Services providers to help them manage and analyze their distribution channels' books of business. BobTrak maintains date-effective servicing relationships, allocates transactions to the correct producer hierarchies, aggregates values across time, and calculates commissions and bonuses. Learn more. One of Canada's leading software platforms for independent insurance brokerages, ClientDesk powers core functions of the digital insurance experience, such as engagement, self-service, and claims management. Learn more. When you're hiring for insurance, you don't need to post on hundreds of job sites. 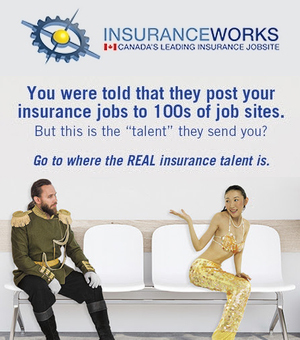 You just need one: InsuranceWorks.ca focuses exclusively on insurance industry jobs, with 50,000 candidates all in one place. Continuing the “insurance platform” theme from last week, a look at basic implementation. In this definition, a platform describes an entity's technology stack of hardware and software, whether on-premises, outsourced, or in the cloud. The entity controls and manages the functionality and processes. In the case of an organisation dealing with the end customer directly or through an intermediary, the users could be staff, a representative or the customer directly. Direct writers with consumers and brokers with insurers, etc. Today the most common usage would be through portals of one type or another. Other firms well may be connected to digitally submit transactions system-to-system. A broker to an insurer connected by an API; a drive-in claims centre reporting a FNOL through an API. The main entity almost certainly then uses other services which operate on their own platforms to request additional information or to validate information – peril scores, prior claims, credit checks – by some API connection; the list of available data sources, the types of date and the purposes seem to increase almost daily. Next week we look at extending the reach of one's platform.